Sure, tarantulas have the ability to bite but it really depends upon the species, much like most animals. Some pet tarantulas have a greater tendency to bite than others, but most are considered relatively docile and passive. These spiders usually seem much more interested in exploring rather than being aggressive. Tarantula bites, while startling and painful, are generally considered similar to a bee sting, and usually no more dangerous. Allergic reactions to tarantula bites are uncommon—some even argue there’s never been a single recorded instance. Regardless, if you’re allergic to a bee sting, handling tarantulas is something I’d avoid as a bite could potentially lead to anaphylactic shock. Is it really worth the risk? Tarantulas rarely bite without provocation or warning. They will usually rear-up (see photograph below), expose their fangs, and warn you to leave them alone. You also want to avoid allowing your tarantula to mistake your finger for food. If your pet tarantula were to bite you, the area of skin will generally turn reddish and there may be some mild temporary swelling. Since most tarantula venom is generally weak, there are usually no side effects. Wash the area with anti-bacterial soap and warm water. Use common sense. 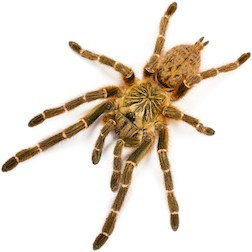 There are always exceptions, so do your research prior to purchasing a pet tarantula. Some species tend to inject more potent venom than others, such as the Poecilotheria and Heteroscodra family of spiders (to name just two), making them more dangerous. These types of tarantula bites often demand medical treatment. Educating yourself on the dangerous species of tarantula leads to greater safety, so do your research. There is no officially documented occurrence of a human dying from a tarantula bite. The vast majority of the time, their bites are insignificant. The above information is for informational purposes only. I’m not qualified to provide medical advice—this is all anecdotal information. If you’re ever bitten by a tarantula or spider, please contact your medical provider immediately. give it some space, because it’s about to bite. Have you heard the story about the scorpion getting a ride on the turtle’s back across the river? Halfway across, the scorpion stings the turtle. The turtle asks, “Why did you do that? Now we’re both going to drown,” to which the scorpion says, “Because that’s just the way I am.” It’s a fable about innate character (or lack thereof). Segue to the OBT. Affectionately known as “Orange Bitey Thing,” in my experience this is the meanest, most aggressive tarantula in the world. Plus, they’re really fast. Feeding time is usually a maelstrom of violence. Most tarantulas only bite out of defense, but this species of spider seems to want to bite. Imagine a rabid dog snarling through a chain link fence. They can make an incredible display tarantula, but never for handling. This Asian firecracker won’t hesitate to bite, and it’s really fast! These active tarantulas hail from Thailand, Cambodia, and surrounding countries, and are one of the most infamous species in existence. Bite first and ask questions later is their motto. Despite being tremendously beautiful with electric blue coloration, it’s not handleable as a pet tarantula and great caution is advised. 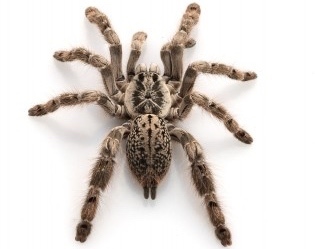 These tarantulas attain a massive size, and are highly sought-after within the hobby. However, they’re also extremely aggressive. They give new meaning to the phrase “rearing up.” Their venom is considered stronger than most tarantulas, and despite their allure, are for advanced hobbyists. Make way for one of the most irritable tarantulas of all. This sinister spider will bite almost anything, and is nasty to a fault. The fact that they’re also really quick is frosting on the cake. Are you noticing a common thread here? The tarantulas most likely to bite are usually also lightning fast! Rarely does this spider miss an opportunity to express its extreme displeasure of being disturbed. They’re big (also called “Haitian bird-eating tarantulas”) so be extremely careful. While there are aggressive species, most tarantulas are not considered aggressive. Due to their general demeanor, the above listed arachnids are not recommended as pet tarantulas. They can, however, make impressive display animals. Ever heard of urticating hairs? 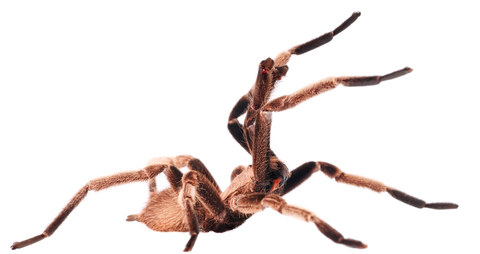 Pet tarantulas have the ability to bite, sure, but urticating hairs are the invisible enemy. Many species of New World tarantulas (ie. North and South American), have the ability to rapidly kick-up these hairs (they’re actually more like bristles) from their abdomens using their fourth legs in a rapid motion. The bristles gently float up into the air like pixie dust. But pixie dust it is not. Avoid breathing the bristles or touching your eyes if you have any bristles on your fingers, as it can cause irritation. The urticating bristles can actually be fatal to rodents who inhale them. The urticating hairs themselves look like minuscule floating lint or dust to the naked eye. 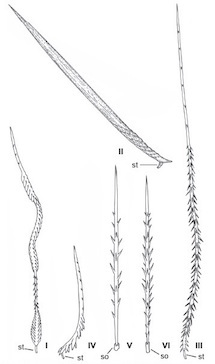 Under a microscope they look like barbed spears, and there are six types. If allowed to land on your skin, they can sometimes cause redness and irritation, although I’ve personally only experienced this with Theraphosa tarantulas. It’s more annoying than anything, but a defense mechanism to avoid if possible. Some species have extremely mild urticating hairs, imperceptible to humans. Others, like the Goliath bird-eating tarantula (Theraphosa sp.) have urticating hairs that can itch and result in a mild rash. Hydrocortisone usually does the trick to alleviate any itching. Your pet tarantula may deliberately spread urticating hairs at the entrance to its burrow. Another use is to protect an egg sac, as the hairs help annoy would-be predators, such as fly larvae. It’s important to note that many species of tarantula that have urticating hairs available to them never attempt to actually use them when handled, this includes Rose hairs and Redknees. Regardless, occasional urticating hairs is a small price to pay to interact with your pet tarantula. I’d recommend using rubber gloves when interacting with Goliath bird-eaters, however. They’re urticating hairs are the only ones that bother me—my forearms get itchy red patches that last a couple days. They seem to itch the most at night.